An aerial view of an iceberg shows you the massive size of the base under the surface of the ocean's ripples that still has a way to go before being completely thawed. 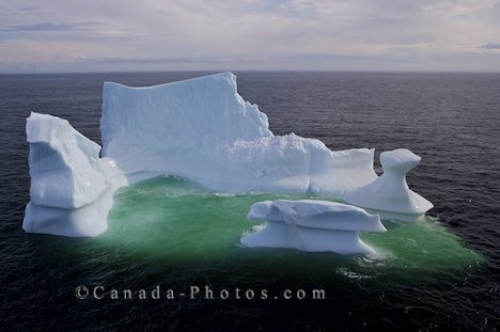 This iceberg floats around the Strait of Belle Isle in Southern Labrador, Canada with the peaks of the iceberg crashing into the ocean piece by piece each day. Aerial of an iceberg floating helplessly around the Strait of Belle Isle in Southern Labrador as it nears the end of its life.